A video of Donald Trump making lewd sexual comments prompted plenty of party stalwarts to abandon the GOP nominee, but Republican voters aren’t ready to leave their man behind: Only 12 percent of Republicans say Trump should drop out of the race. Overall support for Donald Trump dropped just one point in a POLITICO/Morning Consult poll taken immediately after the 2005 Access Hollywood video leaked. Trump would get 38 percent of the vote if the election were held today, Democratic nominee Hillary Clinton would get 42 percent. The poll is the first national survey to test voters’ opinions after the video became public Friday afternoon. A POLITICO/Morning Consult poll taken days earlier on Oct. 5-6 had Trump at 39 percent and Clinton at 41 percent. Trump’s numbers remained stable thanks to the loyalty of the Republican base, a fact that could give pause to party leaders considering publicly abandoning the nominee. Nearly three-quarters of Republicans say the leaders of the GOP should stand by Trump, compared to 40 percent of voters overall who say Republican leaders should stay with their nominee. Forty-one percent of Republicans say they would be more likely to support a candidate who continues to back Trump. Thirty-nine percent of voters say Trump should drop out, while 45 percent say he should stay in the race. Just over a third of independent voters, 35 percent, say they want Trump to leave the race, and only 12 percent of Republicans say he should exit. 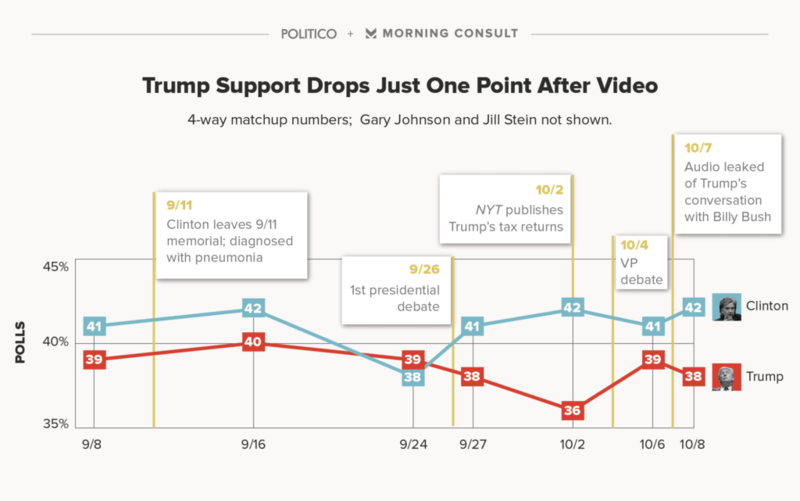 The stability of Republican support for Trump comes even as voters say they have an overwhelmingly negative view of the video. Sixty-one percent said they had a less favorable view of Trump after watching the video, including 48 percent of Republicans. That dichotomy could be explained by how many Republicans viewed Trump’s comments as mirroring how men generally talk in private. Republicans were more than twice as likely as Democrats to say most men talk like Trump in private, 67 percent to 31 percent. Independent voters were split, with 46 percent saying most men talked as Trump did in private. Republicans also responded more positively to Trump’s apology video statement. Sixty-five percent of Republicans had a more favorable view of the candidate after watching his apology, while 35 percent of independents viewed him more favorably. 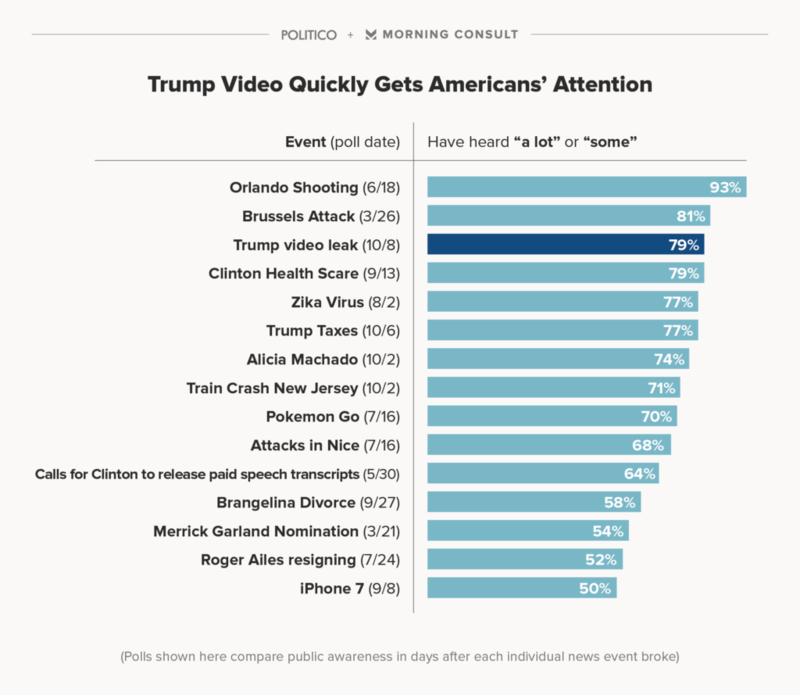 The video quickly grabbed Americans’ attention, with 79 percent saying they heard “a lot” or “some” about the video. That level of awareness is tied with Clinton’s pneumonia episode as the campaign events that have garnered the most focus from voters. A further dip for Trump could come in the following days, particularly after the presidential debate Sunday. Trump saw his support drop to 36 percent in the week following the first presidential debate, during which he routinely defended criticizing a former Miss Universe pageant winner’s weight. The POLITICO/Morning Consult poll was conducted October 8 with 1,549 registered voters and has a margin of error of plus or minus three points. View the trend toplines, trend crosstabs, topical toplines and topical crosstabs at the links.